CANON imagePress 1110+ / 1125+ / 1135+ | Welcome to JJ Bender! 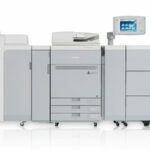 The Canon imagePRESS 1110+/1125+/1135+, is the work-horse of the future. It is the first imagePress put out by Canon in years and the improvements made were all geared towards business efficiency and success with meticulous projects requiring less operator inverventions. The Canon ImagePRESS 1110+/1125+/1135+ digital presses offer the latest in Canon technology since the release of their 7000VP ImagePRESS in 2007. In the years since then, Canon focused on making key improvements which were crucial to business growth and success in the print market. 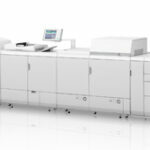 The ImagePRESS 1110+/1125+/1135+ presses deliver high-quality output, streamlined production, relentless reliability, and finishing flexibility for their best production performance yet. Printing speed is practically doubled with fast print speeds of 135, 125, and 110 pages per minute, respectively. The 1110+/1125+/1135+ offers the best quality yet, using Canon’s fine character and edge technology to make automatic adjustments for character proportion, screen processing, and line width to help ensure clear, crisp text and images. A true resolution of 1200 x 1200 dpi in combination with 256 grayscale gradiations produce the fine lines needed for detailed diagrams and small text sizes, as well as rich, deep blacks for superb halftones. Image quality consistency in the ImagePRESS has been optimized with Auto-Gradation adjustment to maintain accurate density so that at the end of each job, your project looks just as amazing as it did in the beginning. In addition with Canon’s twin-sleeve technology, which distributes toner evenly across each page, customers can expect faithful reproduction of images and text, ultra-smooth gradations, and consistent quality throughout the job. This ImagePRESS offers the luxuries of maximum uptime, accurate registration, advanced paper feeding, unattended operation, and complex job productivity. Featuring a suction feeder, paper is now picked up using air instead of rollers which stabilizes the page as it enters the press. The use of air not only helps to reduce paper friction, but also keeps sheets separated to prevent multiple-sheet feeding. The machine is also equipped with ultrasonic multifeed detection, therefore eliminating the need for operator intervention to clear mis-feeds by diverting any multisheet feeds into an escape tray while maintaining job throughput. 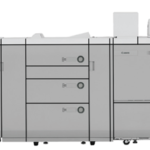 With the ability to hold up to 14,000 sheets (10,000 for the 1110+) and a high-capacity toner supply, this digital color press heightens productivity while also offering on-the-fly replacement of toner, paper, and waste toner. Max Page Size: 13" x 19.2"
Are you looking for a Canon ImagePRESS 1110+/1125+/1135+ lease? JJ Bender will give you a customized Canon ImagePRESS 1110+/1125+/1135+ lease whether you need a short-term copier lease or you want the copier free of charge for the initial six months of the lease period while you develop your revenue. When considering a Canon ImagePRESS 1110+/1125+/1135+ lease, you should carefully analyze your decision because you are required to commit to a large amount of resources for the machine. JJ Bender will guide you through the entire Canon ImagePRESS 1110+/1125+/1135+ lease process once you have decided. We will also provide you with the full lease terms, payments, and what to expect before a first-time equipment installation.